Joan Carretero (Tremp, 1955) answers to Nació Digital after his working day as resident doctor is over. RCAT president discusses in this interview the political moment of the independentist movement, the September 11thdemonstration, the Generalitat financial bailout, the agreements between ERC and Rcat, as well as the evoloution of CiU towards sovereignty. He points out that Spain looks weak. -Did you expect the bailout of Catalonia? -Yes, and I am not a prophet. In fact, during 2010 election campaign in the last parliamentary elections we already warned that the Generalitat would be under intervention. Even if this is not yet formal, in fact there is already a non violent intervention. Look, when a government asks for a bailout it recognices bankrupcy and admits failure. -It should force the Government to examine the situation and call for elections.Wherever a bailout has been anounced, elections have been held, and I do not know why we should be different here. - But what about the government’s claim that this is not a bailout but to claim money that is ours … although we pay interest? -That this money is ours we know since a long time, and many of us we know since a much long,long time. But this government has done nothing to change this situation. If the executive had stood up and had rescued the citizens of Catalonia’s money he would have had our full support, but they voted for the law that allows this failure. -Is this bailout proof that the home rule (autonomy) is over? -Home rule … We never had it, we had an agency, with reduced management capability and no political or economic capacity despite governments headed by Mr. Jordi Pujol showed off and seemed like we were important. But now we do not even have management capacity. Now, to say that we have home rule is a bluff, it’s a joke. Now men will come to tell us how to spend each euro. -You propose early elections. Do you endorse Oriol Junqueras (president of ERC) joint independentists electoral list? -Some time ago, we proposed the widest possible list of forces that want Catalonia to become a normal state, a free state. However, I do not see this list possible with CDC neither with ICV, since, to my knowledge, neither of them want independence. The ecosocialists still speak of federalism and Convergence … well, depends on who speaks. 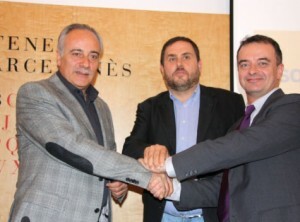 - CiU is a federation that lasts for years and the number two in the organization is Mr. Josep Antoni Duran i Lleida who always says “no, no, no” and always happens what he says … Look, I do not believe it. 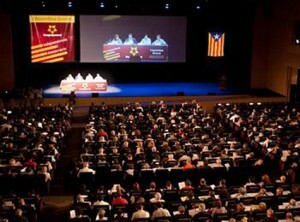 -Will you attend the ANC (Assemblea Nacional Catalana, Catalan National Assembly) demonstration? -Yes, and all of us who can go should go there! We are in an limit situation: either we are a region or a state. The compromise, federal, confederal, an own nation … and other stories, doesn’t work. 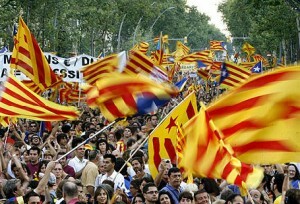 With the economic crisis Spaniards decided to end all stories and euphemisms, and do not want any intermediate position. Either a four province region or a state. - Colonel Alamán evidences that they have lost all euphemisms. - I would say that the intimate desire of many Spaniards is to end up with “the Catalan problem“. Fortunately, the European Union will not allow them to do it. I am sure many share the words of this guy. - And what are we getting to? -I detect there’s a more radical sector of the population more radicalized, more aware that we need a state of our own … There is also a large part of the population to whom the political situation in Catalonia does not concern them. Now we have to convince these reluctant people to join. But the valid proof in Western Europe are elections. - Does independentism lack electoral support? -Everything that is not reflected in a massive vote is useless, the authority is very limited. -If September 11th demonstration is massive, what should be done on September 12th? -To hold elections to decide whether we want Catalonia to be a non politcal subject kneeling to Spain or to be a normal state. -Is it right for President Artur Mas not to go to the rally? -In general, governments should not go to demonstrations. What does the presence of the Government mean? Does it mean that the Government will follow demonstrators requests? The government should listen to the public keep track of it and use it’s political capacity. It is irrelevant whether it will attend or not. What I think is like in a Groucho Marx act, is, when a government official is saying that he will attend as part of civil society. - A president should not demonstrate for independence. Should he proclaim it? -Exactly. If he does not want to do what they ask him to do, he cannot not do it from time to time. It would be like pulling the leg of the people. - What is for you the outcome of the electoral agreement with ERC? -Coalitions need some training to learn how to coordinate, to work … We are quite satisfied, but a year from now we shall be even more satisfied. In fact, we would like to repeat the experience and the coalition. - In October, RCAT will celebrate its 5th National Assembly. What is expected to be the strong point? -Who knows. Maybe things have changed in October. (Laughs). Seriously, RCAT should make citizens aware that if we want a government of the left or right, we must first be able to have a state, because so far only choosed so called governments which had no capacity to rule. -You have been around a few years in independentism. Had you ever seen the independentism movement as it now looks? - Years ago, we were out of the mainstream … Now the strictly political debate, not public, is occupied by “independence or no independence.” Now we are no longer outsiders in debate yet we are still so electorally. -Do you see the enemy weaker? - Yes, much weaker. Spain until a few years ago seemed illuminated by a miracle, with international recognition. Now everyone sees that it is the same state it has always been, with a false economic growth, it has dropped many steps and this discredit is good for independentism.